Sign-up for free samples. Interested? Click Here For A Free Sample. At Second Wind Nutraceuticals, we heavily investigated the blueprint of what makes a hangover and consulted with the best available research in order to craft hang/OVER, a multivitamin and herbal supplement that helps manage and minimize hangovers. We worked closely with a Pharmacist and a Doctor of Naturopathic Medicine to strategically formulate a supplement that replenishes your body of lost vitamins, minerals and helps you wake up feeling great the next day. For best outcomes, take four capsules 45 minutes with food and water before drinking. Take five capsules 45 minutes with food and water before drinking if planning on drinking moderately. You may also take four to five capsules after drinking but before bed for lesser results. 1) Loss of vitamins and minerals from drinking. Disruption of the body from homeostasis through many hormonal and metabolic changes from alcohol. 3) Dehydration causing negative mood changes. 4) Loss of quality sleep. Second Wind Nutraceuticals set out to formulate a supplement that manages these factors. It must be noted that the only surefire way to avoid a hangover is to drink in moderation or not to drink at all. However, by rehydrating regularly, eating a healthy meal before drinking, and picking alcoholic beverages with fewer congeners (like Vodka, Gin, or some pale beers) may minimize some hangover symptoms. 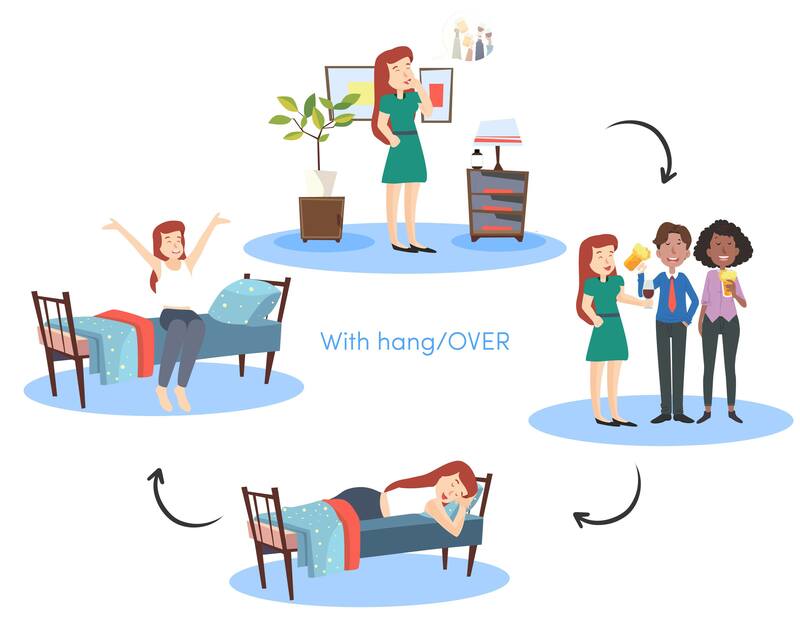 However, if this is not enough for your needs, hang/OVER might be the right choice for you. 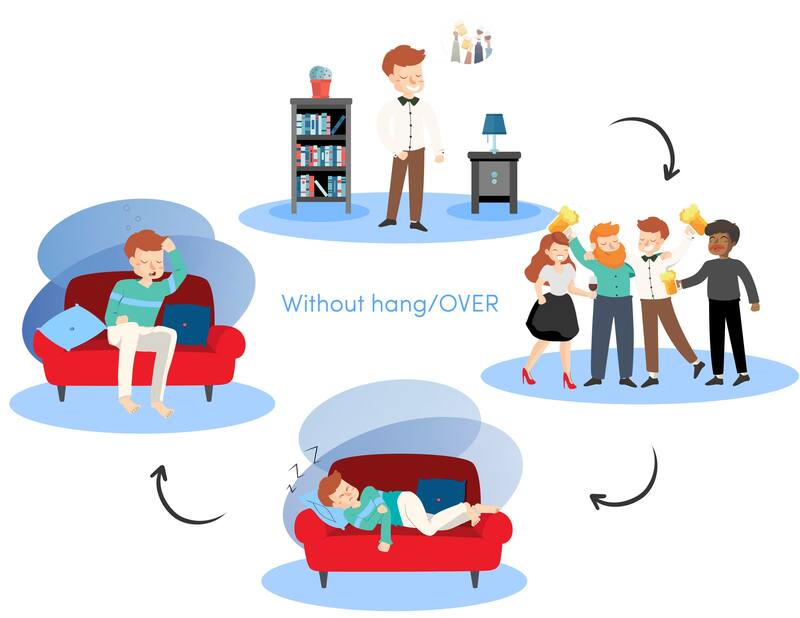 Although our supplement hang/OVER is not a magic bullet intended to solve all the above hangover factors, we have created a Multivitamin & Herbal supplement targeted at managing some of the mentioned causes. We picked the most potent ingredients and weighed them against scientific studies and plausibility to help manage your hangover. Click here for an in-depth look at our ingredients and the studies that support them. Give us a try, sign-up and receive a free sample trial. Let's make hangovers a thing of the past. Submit your email for a free sample of hang/OVER Multivitamin & Herbal Supplement (United States Only). * These statements regarding dietary supplements have not been evaluated by the FDA and are not intended to diagnose, treat, cure, or prevent any disease or health condition. Click here to see what role the FDA plays in the nutraceutical industry. Learn more about the FDA & Second Wind Nutraceuticals. © 2019. All rights reserved. Second Wind Nutraceuticals.